NC-03: Tata coming after Walter Jones? Tony Tata, the state transportation secretary, is seriously considering challenging Congressman Walter Jones in the GOP primary next year. The contest would likely draw national attention, creating a contest between an Army general who is an Iraq and Afghanistan veteran against one of the few Republican critics in Congress of continued U.S. military involvement in the Middle East. Wrenn said Tata’s background as a combat veteran was particularly important at a time when the nation is figuring out how to deal with heightened threats from ISIS and Al Qaeda and other Middle Eastern groups. […] Tata would potentially be the most high-profile challenger to Jones since Jones was elected in 1994. Jones has earned a reputation as a party maverick, criticizing U.S. involvement in Iraq and Afghanistan, and often straying on party-line votes. He has been close to libertarians such as Kentucky Sen. Rand Paul and his father, former Congressman Ron Paul. It’s amazing. Tea Party / grassroots folks talk about coming after GOP incumbents and it’s treated like treason. Stuff like this? Apparently, it’s not a problem. You can sit back and fold your hands and smile while Tea Party influence is purged from office or any other party position. Or you can move into the same war-footing the GOPe has apparently already assumed. 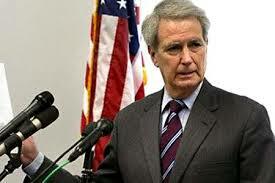 Establishment's Tata to challenge Walter Jones? According to the N&O, State DOT Secretary Tony Tata has put up a trial balloon to challenge Congressman Walter Jones in the 3rd district. Tata has never lived in the 3rd district and never been registered as a Republican in NC. He is a registered Unaffiliated. Tata's top appointees at DOT have also been almost all Democrats or Unaffiliated. It is unclear if Tata would switch to Republican to run or stay an Unaffiliated or where he would try to set up residence in the district. Walter Jones has stood strong for conservative principles in Congress against the squishy GOP establishment. That led the establishment to set a Washington lobbyist to carpetbag into the district to challenge Jones in the primary last year. It looks like they are up to another carpetbag stunt. From the N&O article, it appears that the consultant involved with Tata is Carter Wrenn, the very same consultant who was behind liberal GOP Congresswoman Renee Ellmers.